A big thank you to everyone for making such fantastic Easter baskets for our parade today. We hope you all have a lovely holiday and look forward to seeing everyone on Tuesday 23rd April. Happy Easter from the Nursery team. This week we used two stories to inspire our work. We started the week with Thinking of words to describe the wolf in “Little Red Riding Hood”. The children came up with fantastic language such as vicious and fierce and we then learned the word sly which we think suited him very well. Lots of our provision was red this week and we found out that even pink is a shade of red. We looked at another story by Jan Fearnley “Mr Wolf and the enormous turnip” where a Prince had been turned into a frog. He needed to be kissed by a Princess to unbreak the spell which the children found most amusing as the book repeatedly used the words “kissy, kissy, kiss,kiss” which they loved joining in with! The children were able to use the CD player to listen to the story on their own. This week we took up Mr Grayson and Mr Haslam’s challenge to grow long, fat and weird carrots. We have planted some seeds in pots but are keeping them inside at the moment in case it is still a bit frosty. We filled some tyres with compost so they are ready and will plant them out as soon as possible. We want to wish all our Nursery Mums a very happy Mother’s Day. We hope you like the secret cards we made for you! We continued our wolf theme this week with a story tha was new to everyone “Mr Wolf and the Three Bears” by Jan Fearnley. This time Mr Wolf and his Grandma helped to make a party for Baby Bear but Goldilocks came along uninvited! She had dreadful manners, so the lovely children from Carr Hill thought about ways we could teach her to be kind in the future. The children enjoyed finding our about the recipes they made from Grandma’s Big recipe book and we even used it to make Mummy Bear’s sandwich recipe. The children found the instruction to “wash your paws” very funny but did make sure to wash their hands before making the sandwiches. We ate the sandwiches at snack time and the children’s choices of jam, ham and cheese seemed to go down very well. We have had some lovely sunshine this week and the plants in the Nursery garden are looking very colourful. We have particularly enjoyed watching how the tulips have blossomed and are now looking beautiful. We are hoping the weather is as nice next week too as we are hoping to plant some carrots for the school’s latest gardening challenge. If anyone has any tips about how to grow prize winning carrots, please pop into Nursery as soon as possible as we need all the help we can get! We has a maths focus this week in Nursery but this didn’t stop us enjoying another wolf story. 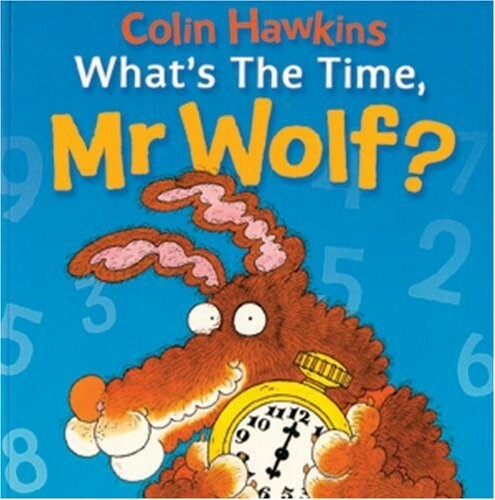 This time we based our learning around the book “What’s the time Mr Wolf?” by Colin Hawkins. We found out about different things that can help us to know what the time is such as a clock, watch, phone and television. We also found it very funny that clocks have hands but no fingers! We thought about the days of the week and that we never come to school on Saturday or Sunday because it is the weekend. We also sorted different activities into morning, afternoon and evening based mainly on food times! 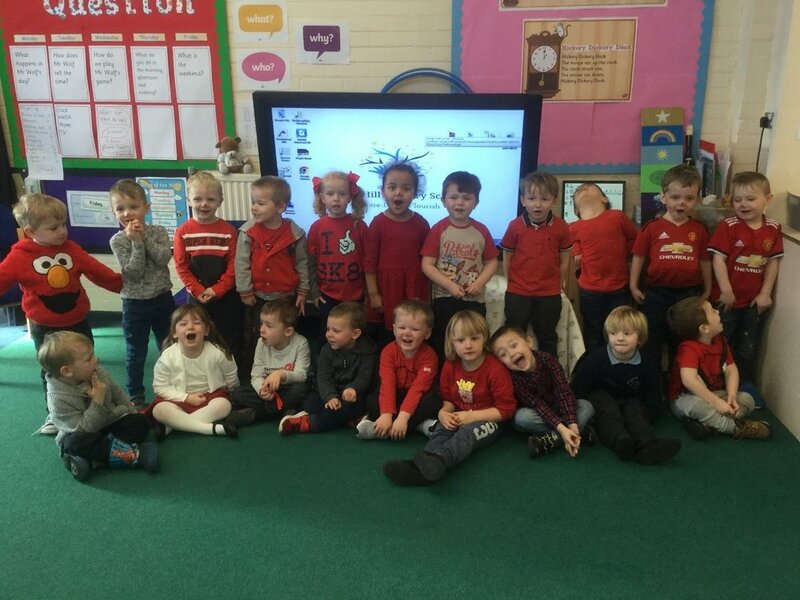 On Friday we helped to raise money for Comic Relief and came to school dressed in red. Mrs Parsons had baked lots of cookies which we enjoyed at snack time. Thank you for all your contributions to this excellent cause. 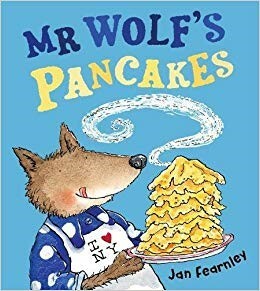 This week we celebrated both Pancake Day and World book day and managed to find the perfect book to base our learning around… “Mr Wolf’s Pancakes” by Jan Fearnley. We loved meeting characters from other stories such as Chicken Licken and Little Red Riding Hood but this time they weren’t as nice as we thought they were going to be. We also found that the book had a very surprising ending when Mr Wolf ate both the pancakes and all the characters! We made pancakes using flour, eggs and milk but also needed oil for the pan. Most of the children enjoyed tasting them with their choice of toppings. Unsurprisingly, chocolate sauce was the favourite! On Thursday we celebrated World book Day and dressed up for the day. We thought about which stories were our favourites and shared them with our friends. This week we started with another familiar story – “The Three Little Pigs”. The children found out lots about the properties of the different materials through first hand investigations of straw, sticks and bricks. The vocabulary the children used was very impressive and our holiday homework to look at different houses had clearly helped. The children really enjoyed taking on the roles of the different characters and putting on voices for them. We had lots of huffing and puffing in Nursery this week! We compared the story “Huff and Puff” by Claudia Rueda with the traditional tale. We enjoyed finding a different ending to the story where the pigs had made a birthday cake for the wolf. We also looked at the different shapes we could see in and around houses. We found lots of squares, rectangles, circles and a few triangles but are yet to find a semi-circle. We’ll keep on hunting! The unusually sunny February weather has meant that our spring bulbs have been looking beautiful. We have daffodils, narcissi and crocus along with the pansies we planted. The hyacynths and tulips look as though they won’t be long either. We are looking forward to planting some vegetables very soon too. This week the children were keen to work on a favourite story “We’re going on a Bear Hunt” by Michael Rosen. The children loved watching Michael Rosen perform the story himself and they carried on doing the words and actions all week! 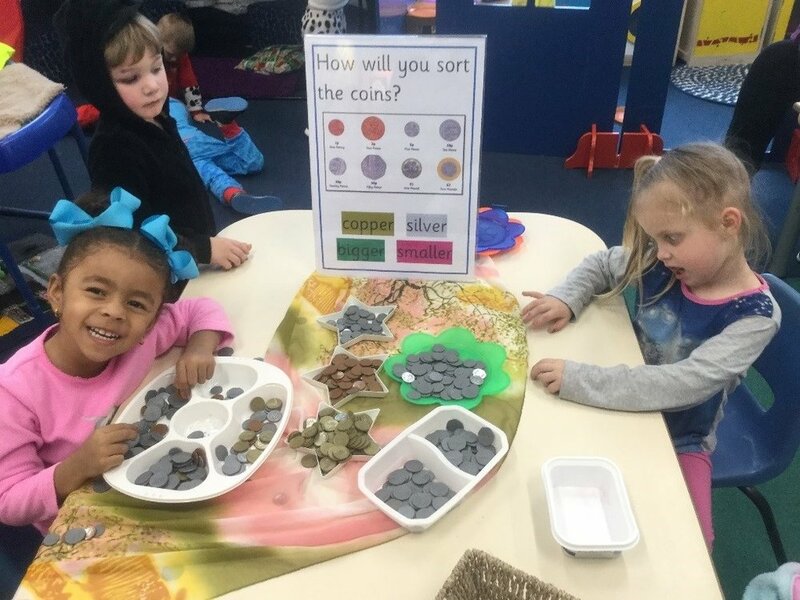 The provision in Nursery mainly centred around both the setting for the story and the sensory aspects of the the things the characters found on the “Bear Hunt”. We asked the question “Are bears real?” which led us to find out that there are actually 8 different types of bears in the world. We compared them and found out that they were usually named after the way they look. The Sun Bear has a large round yellow patch on it’s chest and the Spectacled Bear looks like it is wearing glasses! We are really trying hard in phonics and this showed really clearly when we were adding labels to a picture of a bear, the children tried hard to segment the words themselves using their robot arms. Some of the children even tried to write the labels themselves – this made us so proud! Great work everyone! Have a lovely half term holiday and we look forward to seeing everyone on Monday 25th February ready for our new topic about wolves. This week we had a slightly different week as we celebrated Chinese New Year. 2019 is the year of the pig but we found out that the Nursery children were either born in the year of the horse or goat. We learnt that “Ni Hao” means “hello” in Chinese and we wished each other “Kung hei fat choy” which is “Happy New Year”. The children explored lots of authentic Chinese artefacts and we practised drumming to accompany a traditional lion dance. The activity that seemed to be the most popular of the week was of course tasting some Chinese food. We cooked noodles, rice, sweet and sour sauce and prawn crackers. Mrs Gaddes was given a fortune cookie which said that she will remain calm in an emergency – which sounds like a very good idea for a Nursery teacher! The children have asked if we can go bear hunting next week – I wonder if we’ll catch a big one or maybe we will be scared! Our sign of the week is one that we definitely needed this week. We learnt the sign for “coat” and the children noticed that it was just like putting on an invisible coat!